A 9-year-old girl with known systemic lupus erythematosus (SLE) presents with increasing chest pain. The pain is pleuritic in nature and a pulmonary etiology is suspected. 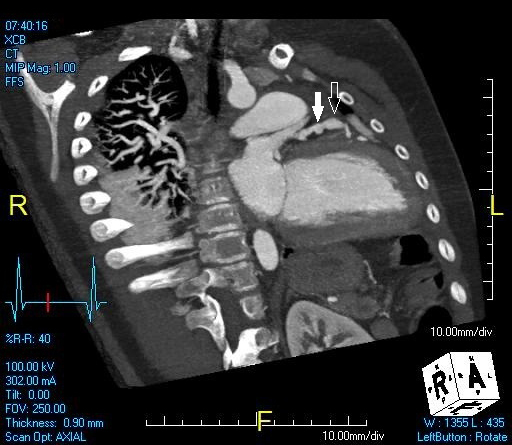 An initial noncontrast CT scan of the chest showed no significant findings within the lungs to explain the patient’s symptoms. 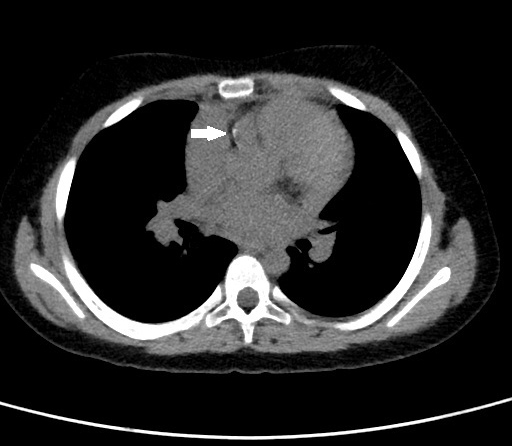 However, a soft-tissue abnormality containing a thin rim of calcification was identified within the pre-aortic space (Figure 1). This abnormality was indeterminate, but possible etiologies included vascular or lymphatic abnormalities. 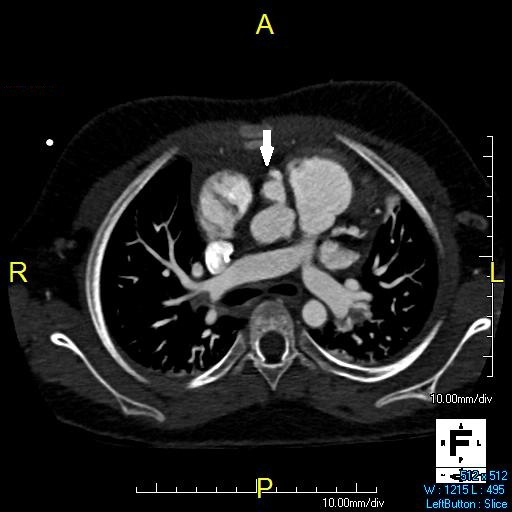 The next day, an ECG-gated, contrast-enhanced CT of the heart was performed. This image showed focal dilatation of the proximal right coronary artery (RCA), just distal to the origin of the artery (Figures 2 and 3) corresponding to the soft-tissue abnormality identified on the non-contrast CT scan. The focal dilatation within the proximal right coronary artery contained a small amount of nonocclusive mural thrombus, as well as a thin rim of calcification (Figure 4). A few smaller areas of focal dilatation were identified within the distal right coronary artery (Figure 3). Within the proximal left anterior descending artery, there was a small focal dilation as well as a more fusiform dilation located just distally (Figure 5). The right coronary artery is most commonly affected.1 Catheter angiography historically was used in detecting coronary artery aneurysms, but due to invasiveness and morbidity, as well as technological advances in other modalities, it is performed less commonly now. Echocardiography is commonly used as a screening exam, with excellent visualization of the proximal coronary arteries.4 It can also give valuable data regarding cardiac function to evaluate for complications. 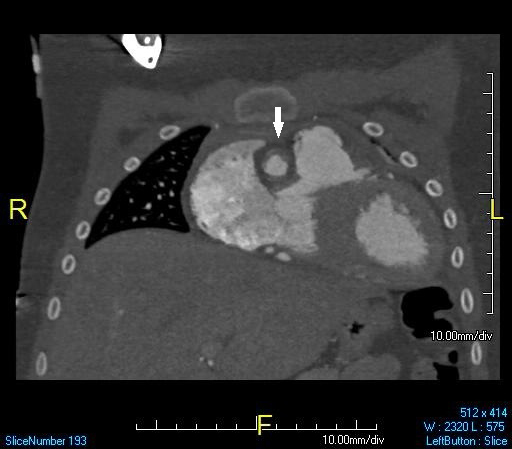 With the evolution of multidetector CT, coronary CT angiography (CTA) is becoming more common. Studies have shown CTA to be highly sensitive and specific—and more sensitive than echocardiography for the detection of and demonstration of fusiform and distal aneurysms.2 CTA findings include concentric wall thickening with dilatation of the vessel. Often, a thin rim of calcification can be seen. Coronary stenosis and occlusion are important complications. Hemopericardium can be a clue to aneurysm rupture or impending rupture. Systemic lupus erythematosus is an uncommon cause of coronary artery aneurysms, with Kawasaki disease being a much more common cause in children. However, children with known SLE who present with chest pain should be evaluated for coronary artery disease, including aneurysms, with echocardiograms or contrast enhanced CT. Treatment varies but can help prevent life threatening complications. Ebina T, Ishikawa Y, Uchida K et al. 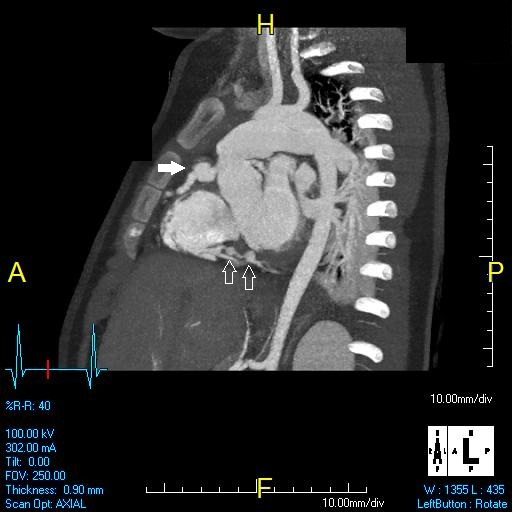 A case of giant coronary artery aneurysm and literature review. Journal of Cardiology 2009; 53:293-300. Johnson P, Fishman E. CT angiography of coronary artery aneurysms: Detection, definition, causes, and treatment. AJR. 2010; 195:928-934. Karrar A, Sequeira W, Block J. Coronary artery disease in systemic lupus erythematosus: A review of the literature. Semin Arth Rheum. 2001;30:436-443. Newburger J, Burns J. Kawasaki disease. Vasc Med. 1999;4:187-202. Coronary artery aneurysms. Appl Radiol. Prepared by Dr. Welles while a Radiology Resident at the Department of Radiology, Mayo Clinic, Rochester, MN; Dr. Jorgensen and Dr. Richard Towbin, while at the Department of Radiology, Phoenix Children’s Hospital, Phoenix, AZ; and Dr. Alexander Towbin while at the Department of Radiology, Cincinnati Children’s Hospital, Cincinnati, OH.